The festival is a three-day event that displays the underground local metal scene through live performances, art, and gothic punks dressed in black-chained clothing. Regardless of the scary stereotyping that those people often get, the various bands who played are what made the festival exceptional. One of those was Tragic Black. Tragic Black, a metal band that started here in Salt Lake City, has not always been the head-banging band they are today. In fact, Tragic Black used to dabble in industrial pop, as seen in their old YouTube videos. When members John Varoz (Johno) and Kyle Leary joined, the two metal heads convinced other members Derek Rhodes (vISION), Vyle Black and James Perry (Septus Black) to make their industrial-pop sound into a harder combination of industrial and heavy metal. 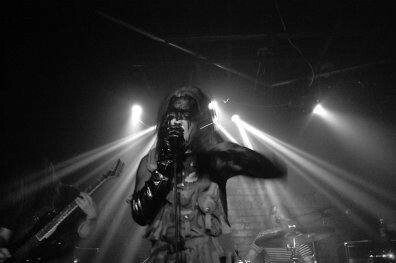 “With members constantly changing,” says vocalist Derek vISION, “[these] people come in and we evolve our music.” Describing themselves as “Tragic Metal,” the band is not the typical screaming hard rock or I-need-an-Advil metal that some bands are; rather, they are the complete opposite, and the exact definition of what industrial metal should be. Out of all the performances at the Dark Arts Festival, Tragic Black was the band who could not be beat. From the moment the set began till the end, Tragic Black’s performance was a high-energy performance that not only gave the audience head-bang whiplash, but kept them pumped for more. Vocalist Derek vISION, sporting leather pants and an Army-like vest, started the concert in a style similar to the great Iggy Pop. While Derek performed, Vyle, James, Kyle and John all contributed to the energy, which in turn uplifted the audience. The band was so dynamic that the lost Guido-looking jocks at Area 51 who walked into the festival by mistake used their Jersey Shore demeanor and raised up classic fist pumps to the aggressive sounds. The lyrical songs only brought the audience anticipation to hear Derek speak about the songs and their “element” themed albums. “There is a spiritual connection behind it. All ya’ know what I mean. Even though it’s really, really dark, there’s still a light at end of the tunnel kind of feeling,” he said. Before their last song, "Apparition," Derek spoke about some of the meanings behind the songs, which included feelings toward religion, politics, people, etc. When the powerful song finally dropped, the audience launched toward the front of the stage, head thrashing and singing along. Overall, Tragic Black was a satisfying discovery that I had not expected; it was clear that Tragic Black was no tragedy. They had a dark, aesthetic decadence that concluded the festival with a memorable performance. 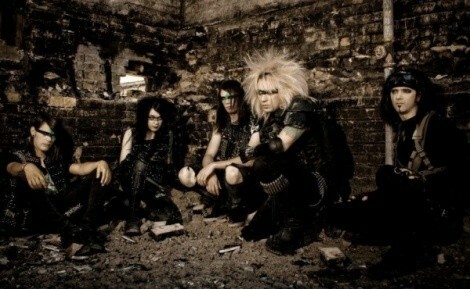 For more information about Tragic Black visit: TragicBlack.com or find them on Facebook.